As you enter, there are seven steps from Market Street to the nave level There are also seven steps in the chancel leading up to the altar. The number seven here represents the Triune God (Father, Son and Holy Spirit) and the Four Corners of the globe. The ceiling of the nave is in the shape of an inverted ship hull. In medieval times work like this was often done by shipwrights since they were the only people that could work on this scale. in our present in reminds us of the Biblical ark which saved humanity and continues to save today with Christ, the captain of our salvation in charge. On the altar you will see two carved figures. On the left is Moses representing the Old Testament. On the right is Luke, representing the New Testament. 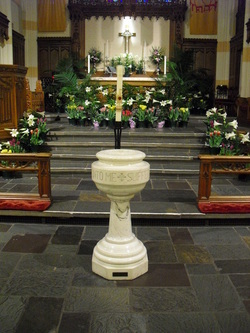 In the top center of the altar you will see a dove representing the Holy Spirit descending from heaven. In the woodwork you will see wheat and grapes representing the Body and Blood of Christ. You will also see carved roses; these are the symbols of Martin Luther. In the center of the altar window, you will see the All Seeing Eye of God. This reminds us that God sees all and is in control. Union's present sanctuary was designed in 1925 by J.A. Dempwolf. The cornerstone was laid in January of 1928 and construction completed in 1929. The sanctuary's dedication was celebrated in September 1929 with a week long series of services. Unfortunately, Union was Mr. Dempwolf's last design. The noted architect passed away before its completion and his son completed the building. From Market Street you will notice the front facade consisting of two towers. The smaller west tower is a corbeled tower and is purely for decoration. The larger east tower contains the church bell. You will also notice the pointed arches of the entrance and the rose window. If you look around into the courtyard to the est, you will notice large stone columns between the windows. Theses are the buttresses. Their purpose is to help support the weight of the building and allow more open wall space for the stained glass windows. Through the front doors you will enter the narthex. If you look at the ceiling, you will see an example of ribbed vaulting. This style of ceiling was much stronger than previously used and allowed for very large open spaces. Union's sanctuary is an exceptional example of neo-gothic cruciform architecture, meaning in the shape of a cross. The nave and chancel form the upright and the baptistery and choir loft form the arms. The nave is flanked on either side by aisles, which are defined by a series of columns and pointed arches. These, along with the buttresses, help support the weight of the building. I the aisles you will notice stained class tracery windows. The upper part of the nave, the clerestory, is also designed to allow more light to enter the building.